The objects on display in the Kodak Gallery explore the history of photography, from the invention of photography to the digital revolution. 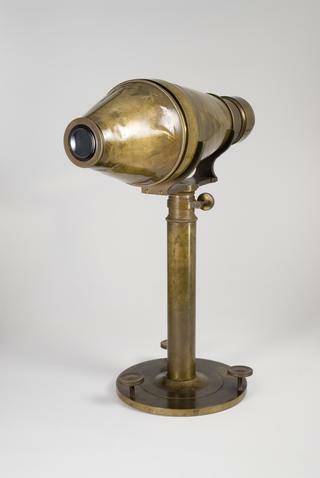 Calotype camera with lens and metal focussing cover, (mahogany), c 1839-1842. 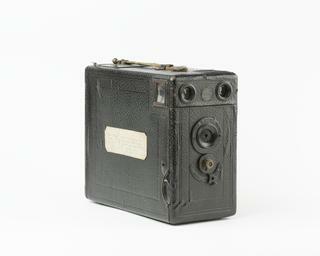 Camera owned and used by William Henry Fox Talbot; made by Andrew Ross. During 1838 and 1840 Talbot purchased a number of cameras to make photogenic drawings from the London instrument maker, Andrew Ross. Equipped with simple lens there is also an inspection hole in the lens panel above the lens that was use to check that the image was centrally located on the sensitive paper and correctly focused. A daguerreotype of Jabez Hogg and Mr Johnson, 1843; Jabez Hogg photographing Mr Johnson in Richard Beard's studio, c 1843. A daguerreotype from 1843 which is thought to be the first photograph showing a photographer at work. The image depicts Jabez Hogg photographing W S Johnson in the studio of Richard Beard. 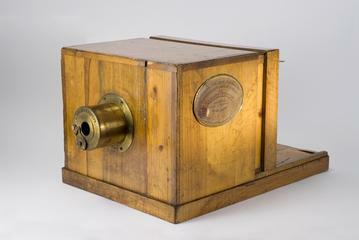 Camera with lens and metal focussing cover, (deal wood), c. 1840. During 1838 and 1840 Talbot purchased a number of cameras to make photogenic drawings from the London instrument maker, Andrew Ross. This camera may derive from this source. Equipped with simple lens there is also an inspection hole in the lens panel above the lens that was use to check that the image was centrally located on the sensitive paper and correctly focused. 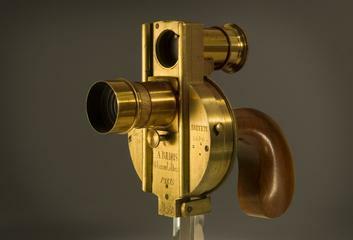 Camera with hole and cork for focussing, and rack for raising, c 1836-1840. 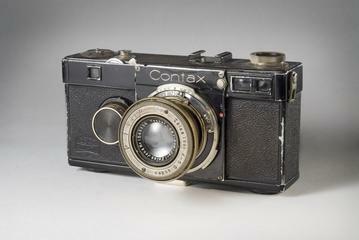 Camera used by William Henry Fox Talbot. During 1838 and 1840 Talbot purchased a number of cameras to make photogenic drawings from the London instrument maker, Andrew Ross. This camera may derive from this source. Equipped with simple lens there is also an inspection hole in the lens panel above the lens that was use to check that the image was centrally located on the sensitive paper and correctly focused. Camera Obscura, sliding box construction with hinged ground glass screen cover, c.1800. Traingular section sloping glazed earthenware stand for supporting daguerreotype plates during washing. A daguerreotype portrait camera with large compound lens, 1857-1860. Camera bears ivory plaque inscribed 'G Knight & Co. Philosphical instrument makers, 2 Foster Lane, London.' Lens inscribed 'No 8764 Voigtlander and Son, Wien and Braunschweig'. Carrier box for wet plates, with five large format wet collodion negatives, c 1855. 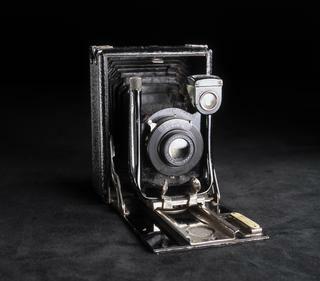 Calotype camera, wooden sliding body camera probably for paper negative materials with Ross lens, with two disc stops, achromatic c. F12 in rack and pinion focusing mount. On brass lens panel, sliding rising front. Extra extension on sliding body, hinged extension baseboard, with sliding bolt catches. Ground glass focusing screen in removable frame. Two double darkslides, with provision for glass to hold paper flat. Two double darkslides, with provision for glass to hold paper flat. Sliding box-type camera (most common in 1840s); Ross lens plate holders for half plate size (16.5 x 12cm). Book: `The Coming of the Fairies' by Sir Arthur Conan Doyle. First edition, London: Hodder & Stoughton Ltd., 1922. Illustrated. Leather (?) bound. 85x100mm black Morocco leather book-type case. Front inlaid with mother-of-pearl and gold leaf in bouquet of flowers design. Gold leaf in scrolls around edges. Black lacquered with gold leaf scrolls. Lined with patterend red plush and gold leaf pattern around inside edge. Pinchbeck frame. 53x65mm daguerreotype three quarter length portrait in profile of young woman seated by table. Face and hands tinted pink. 85x100mm red Morocco leather case with two latches. Lined with plain red plush. Rectangular gilt mat with domed top. Bound but not framed. 58x70mm daguerreotype three quarter length portrait of elderly lady seated with book. Wearing white poke bonnet. Fully tinted with gilt on book. Slight tarnishing along bottom edge. Pearlware vase with pale blue and pink floral decoration on sides, gilding to rim and handles and surround for photograph, Königlich privilegierte Porzellanmanufaktur Tettau of Bavaria, about 1900. Transfer print on base reads 'Kgl Priv Tettau'. Body of vase has carbon print of author Rudyard Kipling in sepia, fired-in, with gold decorative border. Double sensitising box for daguerreotype process. Wooden case with two compartments containing china dishes; remains of supporting coil springs in case (very corroded), sliding frosted glass covers; sliding plate holder for 4 3/4 x 6 1/2" plates. Clear glass flask, spherical body, long tubular neck, possibly English, 1871-1920. 100x125mm dark brown rectangular union case same as 1990-5036/UC01, UC02 and UC14. No picture. 122x100mm dark brown union case 'The Gypsy Fortune Teller' by A P Critchlow and Company. Trade paper inside. Design both sides. Lined with purple plush with formal desing in centre. No mat or frame. No picture. 90x97mm dark brown union case by S Peck (Trade Paper on back says 'S Peck's Patent Feb 5th 1856 - H Halverson's patent Aug 7th 1855 - assigned to S Peck'). Die cast by H W Hayden, from picture by Sir Thomas Lawrence 'The Calmady Children'. Shows two girl children close up in a field. Back is mostly plain with grape design in centre and leaf design in four corners. Lined with purple plush with formal motif. Oval gilt patterend mat. Pinchbeck frame. 60x70mm collodion positive by J TImms, 31 High Holborn, London. Three quarter young gentleman seated almost full face. Some tinting. Nice trade card backing picture. Flask, clear glass, for pouring, European, second half 19th century. Hand vice for polishing daguerreotype plates. D shaped wooden handle attached to wooden base; notched brass strips at each corner, one fixed, the others adjustable, fixed by butterfly nuts. For plates approximately 55 x 70mm. With one plate. 132x162mm red Morocco leather case with two latches. Lined with plain red plush. Rectangular gilt mat with domed top. Picture bound but not framed. (One latch broken). 85x115mm daguerreotype full length portrait of mother with her four daughters. One sitting on her knees, the other three standing. Fully tinted. Some tarnishing along bottom edge. 125x100mm dark brown restangular union case by Littlefield, Parsons and Company. Centre design of case similar to 1990-5036/UC03. Leaf design around edges. Flower motif in four corners. Trade paper. Oval gilt mat with shield design in four corners edged with leaves and surmounted with star. Purple plush lining with formal design. No picture. Faienceware decorative plate (marked TH Fenal faienceni de Badonviller, showing cartoon of interior of photographers studio, French c 1890; 8" diameter; transfer printed with blue martial images around rim around central black printed image of photographer's studio. Marking suggests connection with a Faience factory established by Nicholas Fenal in Bandonviller, France, in 1897, managed by Theophile Fenal after 1922. Metal headstand (incomplete) with two clamps. Clear glass flask, spherical with metal rim, by Ets Leune, 28 bis rue du Cardinal Lemoine, Paris, France, 1851-1900; stopper missing. 1/6th plate daguerreottype by Claudet. Subject: portrait of a girl. Nickel plated camera lucida, with g-clamp fitting, telescopic shaft. Plus ten correction lenses and fitlers, in fitted case. For whole plate plictures; black composition; formal design on reverse. Watch type actinometer with in-door meter dial. Watkins Meter Company. Levelling stand for daguerreotype toning/gilding. 130x95mm iron frame with plate supporting pins held horizontally on 150mm vertical rod fitted to round base with three levelling screws. With spirit lamp. Gilding process developed in 1840, improved appearance and stability of the daguerreotype. Wooden daguerreotype developing box supported on sliding side panels, 200 x 135 x 240mm closed. Brown glass inspection window on side. Dished sheet iron bottom for mercury thermometer on front panel, bulb broken. Plate supports at approx 45 degrees, hinged door for front access. With glass spirit lamp. Box has a zinc plate holder with extracting rod for 10x12cm daguerreotype plates. It also has a zinc adaptor for 8x12cm and 7x12cm plates. The side of the box extends to from legs, providing a space for a spirit lamp. Circular detective camera for 15cm diameter glass plates, six pictures 4cm pictures, Fitted with a rapid rectilinear lens, fixed aperture and focus, rotary shutter cocked by winding knob, released by pulling string. Plated finish no 6738. Sold by J. Robinson & Sons, 172 Regent Street London. C.P. Stirn. Photographically illustrated book, 'The Poetical Works of Sir Walter Scott with Fine Illustrations'; blue leather binding with gilt decoration, full board, with albumen prints pasted in. One of 186 books illustrated with original photographs, covering the period 1854-1895. Portable reflex replica of Fox Talbot's Camera Obscura, original c 1800.